In preparing for a recent Bangkok workshop on the archaeology of rice, I have collected some thoughts of the proposed methodology for tracking rice domestication using rice husk phytoliths (the "double peaked" cells from lemma and palea). Size and shape of these varies and has been suggested to be useful in tracking domestication through measurements on populations (Zhao et al (1998)), although these are not definitive because of large degrees of overlap and because cell size is also impacted by environmental conditions. An explanatory mechanism for how these change during domestication has never been satisfactorily elaborated, although some relationship to grain size change seem plausible. 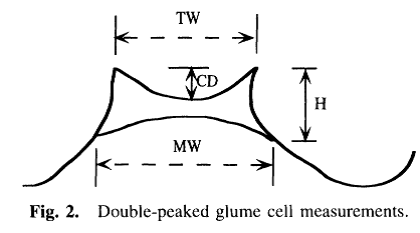 The proposed method for looking at double peak cells and domestication uses 5 measurement on each phytolith as defined below, left (from Zhao et al 1998)- note that H is measured twice on each side of the phytolith. Some of these are then used in squared form. These are combined in discriminant functions that are meant to assign individual phytoliths to like domesticated or wild (i.e. if the domesticated score is greater than the wild score: formula at right). As originally developed, Zhao et al (1998) reported correct classification in their modern reference set was correct in >70% of test cases. The formulae were developed by taking Bayesian approach to discriminant function analysis. In an attempt to employ and extend this work, we attempted to replicate this in London with modern rice accessions, but found a correct identification in only 44% of cases (Harvey 2006). 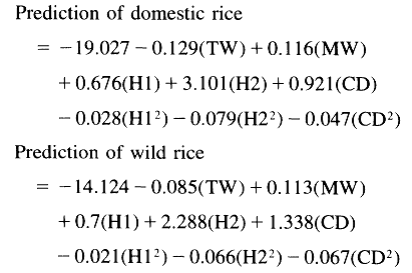 In addition measurements on phytoliths from Chalcolithic sites in Orissa (Gopalpur and Golbai Sassan) predicted a majority wild rice and on 39% domesticated. However these sites (dating 1500-1000 BC) have spikelets bases that indicate fully domesticated rice (100% non-shattering at Gopalpur and ~70% at Golbai out of a small sample size: unpublished UCL data from Kingwell-Banham 2015). This indicates that this phytolith discrimination method is unlikely to work in India, raising questions about what biogeographic contexts it would be useful in, if at all. One problem is that some of the variation in ancient cultivars may not be well represented in modern landraces. Indeed some of the measurements on archaeological phytoliths from Orissa fell outside the range of modern material, both wild and domesticated. Also, against this method are two applications in China that have yielded results that are illogical with regards to what is known about rice domestication. As applied by Zhao (1998) to Diaotonghuan cave in Jiangxi and change from predicted wild in pre-ceramic layers and predicted domesticated dominance in early ceramic layers was found. At the time Zhao wrote this it was assumed the that advent of pottery was Neolithic and sometime in the early Holocene, but recent dating work on nearby Xianrendong and another South Chinese cave, Yuchanyuan, indicate the ceramics began to be produced around the Last Glacial Maximum or just after 18,000-16,000 BP. The ceramics at Daiotonghuan are comparable and thus this would re-date the alleged rice domesticated to ~18,000-16,000 BP, nearly 10,000 years earlier than potential sedentary, agricultural villages. An more plausible alternative explanation is that rice husk cells (and grains) changes shape in response to the major and rapid change in climate and atmospheric carbon dioxide levels that took place after the LGM. As applied by Itzein-Davey et al (2007) in the Lower Yangtze region to a stratigraphic sequence of Qingpu rice bulliforms dating between 2300 BP and 1800 BO (i.e. Warring State through Han Dynasty era), they found the majority of double peaks were predicted as wild, often as much as 80% in some samples. Rice was certainly morphologically domesticated in the Lower Yangtze long before this and we would expect fairly intensive rice agriculture during Han times. These results also call into question this index. Nevertheless plotting double peak measurements over a time series may provide a line of evidence for rice that is changing and evolving morphologically. This has recently been applied in South America to argue for a lost rice domesticationin the Amazon (Hilbert et al 2017). In the context of Chinese rice domestication the study of Wu et al (2014) demonstrated both that wild and domesticated predictions are very mixed on sites of early cultivation but also that there is trend for more double peak cells to fall towards the apparently domesticated end of the spectrum through time. The bottom line: Variation in husk phytoliths exists but its significance in terms of domestication, varietal changes, cultivation ecology remains unclear and deserved further study. I know this will sound dim, but what exactly is a double-peaked phytolith? It looks like it might be a cell wall type analogous to the papillae that we find in the husks of wheat. 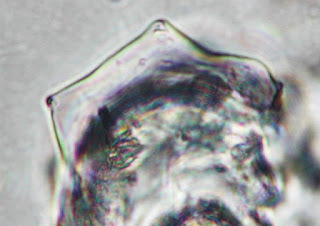 In other words, what is the anatomical origin of these phytoliths? I have been wandering around the literature for ages an nobody seems to say!